We absolutely love these beautiful wedding invitations. They are even better than we could have hoped for! We've had lots of positive comments from friends and family who are all so impressed with the fantastic use of wood. It's just so creative - something a little bit different and they fit perfectly with our outdoor garden wedding theme. Claire was wonderful to work with, our invitations arrived very quickly - great service all round. Definitely recommend lilykiss to others. Thank you for our beautiful wedding invitations, we adore them! The wood feels like a heavy paper stock, but still very lightweight so guests can easily stick them on the fridge. The swing ties are a great touch and the style tied in perfectly with our venue - Harvest. Thank you for posting these so quickly, great service. Absolutely beautiful invitations that look that much more amazing in person! This design is stunning and the lilykiss team cater to any alterations very quickly! 10/10 service and they were posted very quickly! Will be recommending these to anyone and everyone! Our invites arrived and are amazing. We have not had anything but positive feedback from our friends about them. Claire was so helpful and was very accommodating with the various changes we made. She even adjusted the font colour to suit our theme. I'd highly recommend these unique invites. SO excited.. Printed on... WOOD! Hot off the press and they look just unbelievable - not to mention a truly environmentally friendly option, a tree is planted for every order you place! This is the invite your guests get and go... 'um.. WOW', stare at it for 10 minutes in awe, feeling its qualities - then call you immediately, so excited about your wedding, and incredibly jealous they didn't have these invites for their wedding. Just so much to love with these unique wooden wedding invitations. Firstly.. they just look divine. The wood grains peeking through this incredibly sweet little blossom wreath design and wording just looks, sublime. It has that rustic charm that really, nothing in the paper world can compare with. The grains are subtle and really add a gorgeous blend of colours through the pastel ranges, heaven. The effect is unreal. This sweet folky wreath illustration just sits perfectly with this whole wooden big time X-factor theme, the wild bushy florals and artfully drawn leave and foliage really do this new wooden technique - total justice. The hand styled fonts have all been carefully chosen to sit within this theme. The wood is thick enough to really be a strong little piece, its not at all delicate so it looks great with its little tag and twine tied around. It stands as a rigid invite. As well - as seen here we have 2 woods to choose from - the lighter birch, or the darker cherry wood - both stunning!! And suits this design perfectly - it's nice to have options as the effect is changed a bit with each wood type. But.. 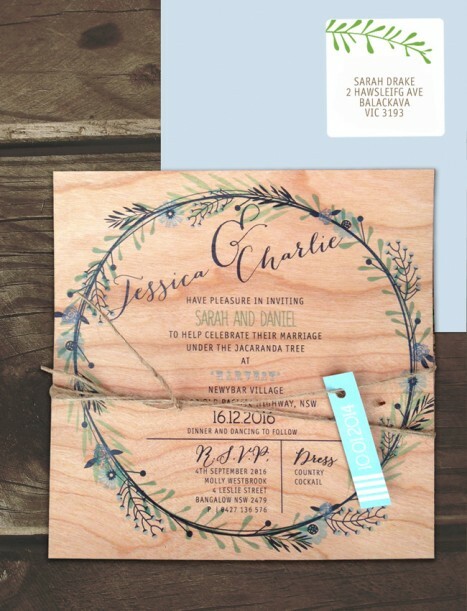 The most exciting part is what a great choice for the environment these wedding invitations on wood are. Not only are these little guys gorgeous and unique looking and feeling, they are a great eco-friendly option! Printing on wood actually use less trees than printing on the same amount of paper and our printer plants a tree with every order. Thats a full tree, even though your invites will only use a tiny fraction of a tree to produce. The entire print process uses less energy, no water, much less waste and far less chemicals than the paper equivalent which makes the whole process better for the world. Yes we love them and their beautiful little sustainable set up! We are amazed at just how special these wedding invitations are in every way. So much to love. As you can imagine - these designs are so intriguing based on their printed material that you really have to see one first hand to appreciate them. Pictures will never properly explain their beauty and just how well this cute design works ion the wood. Order a sample for just $5 to see for yourself why we are just so besotted with our newest Lilykiss members. We will include a kraft earthy matching brown envelope as well - options are goo! This design comes with matching rsvp cards, place cards, menus and all other stationery items - please send us an email for pics, they will be online soon. We hope you love these as much as we do. Claire and The Lilykiss Team x *Please note, the cherry wood is the darker and most grainy - so pretty, but given the nature of the material, being wood! The colour might vary slightly for your actual order from the sample you receive. It will still of course be cherry wood, but we can't guarantee the colour of each tree, they will be similar but some have a little more pink undertones and some a little more yellow - however they are all just divine. Part of the beauty of woking with a natural material. Also note that the wood comes in 2 thicknesses a thicker is available on request. As well we are busily getting up matching rsvp cards, placecards, save the date cards and menus and all other matching stationery items in this wedding invitation design! They look amazing as a set please ask us for images if you are interested as we just haven't had time to get them up as yet! Soon!